Welcome to the Steve Jobs based Join Up Dots Free Podcast Interview with Dwain Scott & Van Shumake Jr.
Todays guests, yes we have two people to join us on the Join Up Dots free podcast interview, are guys that through the online world I have got to know very well. He has had a path that has moved through many different areas from wanting originally to be a police officer, to frontline supervision, Manufacturing, installing fences, and even following Mel Gibson around for a day snapping his every move as professional photographer for Disney. The other, is from Detroit and spent many years in the US Marine Corps, before leaving the military and once again combining numerous different occupations. He has built foundations for newly constructed homes, manufactured aerospace products & parts, and even became Detroit’s very own Jerry McGuire by starting his own small sports agency where he represented professional baseball players. 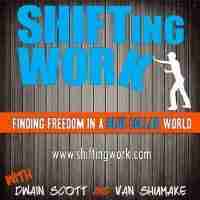 And now together they find themselves on the cusp of a new adventure, as both of them bring their personalities, knowledge and belief that they can help the world find away to transition to a new life away from the 9-5 grind, with their new online show, the “Shifting work” podcast just about to launch. So how did these two guys meet, and get to work together even though they live thousands of miles away from each other? What was it about their previous incarnations that didn’t quite work out for them? And how do they maintain that unshakeable belief that the dream future they work so hard for is just around the corner. How it is so important to create your own reality and not ask for permission from anyone to grab the future you deserve! Why the requirement to have a hustle muscle is so strong, and needs to be developed everyday…the more you hustle, the bigger the muscle! How Van sat in a job for 8 years and hated everyday, but put up with it purely for the pay check he received every Thursday, but wouldn’t do that now! How Dwain loves the fact that his work, can effect just one person in the world, and the thought of providing value to that person is the fuel that lights his passions! How computer games are simply designed to make us old people look pathetic and the kids super cool……that isn’t good!